Humanitarian and development organizations working in conflict-affected settings have a particular responsibility to do no harm and contribute to the wellbeing of the population without bias. The highly complex, politicized realities of work in conflict- and post-conflict settings often require quick, pragmatic and results-oriented decisions, the foundations of which remain frequently implicit. Such decisions might follow an intrinsic logic or situational pragmatism rather than intensive deliberation. This paper reflects on the realities of working on land governance in post-conflict settings shaped by migration, ethnic division, power struggles and limited statehood. 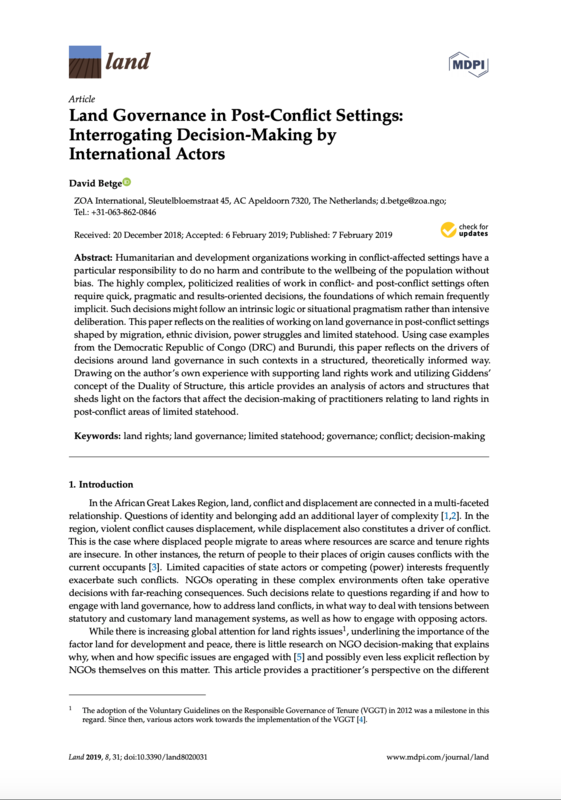 Using case examples from the Democratic Republic of Congo (DRC) and Burundi, this paper reflects on the drivers of decisions around land governance in such contexts in a structured, theoretically informed way. Drawing on the author’s own experience with supporting land rights work and utilizing Giddens’ concept of the Duality of Structure, this article provides an analysis of actors and structures that sheds light on the factors that affect the decision-making of practitioners relating to land rights in post-conflict areas of limited statehood. ZOA is an international relief and recovery organization supporting vulnerable people affected by violent conflicts and natural disasters in fragile states, by helping them to realize dignified and resilient lives. ZOA operates in more than 15 countries, in difficult locations where our field staff directly provides assistance to the most vulnerable victims of displacement. The countries in which ZOA is present are Afghanistan, Burundi, DR Congo, Ethiopia, Jordan, Kurdistan Region of Iraq, Liberia, Myanmar, Philippines, South Sudan, Sri Lanka, Sudan, Syria, Uganda and Yemen.